Kidz World begins on September 3rd from 9:00am-2:15pm. Kidz World integrates fun with learning. Our program is designed to enrich the whole child--spritually, academically and creatively. We want to open your child's heart to the word of God over and over at Kidz World. God's love is made real with simple biblical truth…scriptures, repetition and illustrations make it tangible. Our chapel songs are awesome worship and you'll love hearing your kid sing them to you at home. Think P.E. in disguise. Explore instruments and learn rhythm while having a whole lot of moving fun. Music permeates every part of our program…the repetition and finger play is excellent subliminal learning and they amaze themselves with what they know! You’ll find yourself recording them singing themselves to sleep at night with one of our many school songs. We follow FISD regarding bad weather closure, except during “delayed openings.” (Kidz World will stay closed all day.) Check the Frisco ISD website link above for their weather closure updates or check WFAA.com for their local broadcast of up-to-date information. CLASS SIZE AND AVAILABILITY IS LIMITED. This online registration will be complete and eligible for class placement once the non-refundable fee has been received based on availability. Please make checks payable to Kidz World and mail to the church. Monday-Thursday; 9am–2:30pm; summer hours vary (call for appointment); Forms & literature may be dropped by our secured mailbox at any time. 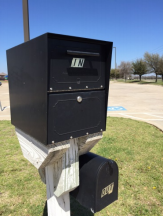 The mailbox is located in the southeast corner of our parking lot. Please use the locked top black box only.